Why did I get a Tax Notice? One might panic when one receives a tax notice, even though the reason for getting it could be a minor mistake. Thus, it’s substantial to have a grasp on the concept of the reasons of getting such notices. AllIndiaITR helps you by handling all your tax-related troubles. For tax notices, go to the How to respond to a Tax Notice page. Here, your queries will be addressed by a tax expert and you will be assisted in drafting a correct reply to the notice obtained. Let’s understand the basics first. A tax notice is a signal sent by the Income Tax Department via physical mail to the taxpayer’s address or on email. The Central Processing Centre (CPC) processes the online tax returns. You can receive a tax notice for several reasons – some requiring due caution and some are just informative. 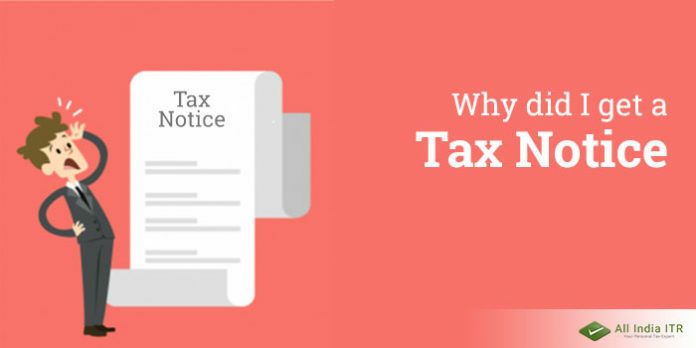 Below are the reasons why you may get a tax notice. If you have not filed your income tax returns in the past few years then you could receive a notice from the Income Tax Department intimating you about the same. If your income for the current year is much lower than that of the last year, then the IT department may go for reviewing some of your documents. The department will send you a notice for explaining the income drop. Although, such problems occur mostly with businesses and not with salaried individuals. If you have not disclosed any additional income or any exempted income in your tax return, the IT Department will send you a notice to do so and may even like to check your documents. A notice can be issued by the Income Tax Department if you carry out a high volume transaction. High-value transactions include deposits of more than 10 lakh rupees in a financial year, purchase of any immovable property worth more than 30 lakhs, purchase of gold exceeding 1 lakh, etc. You will be required to report such transactions to the Income Tax Department with detailed information about the same. If you have deposited cash in large quantity into your bank accounts, especially after demonetization, then you must have already received a notice from the IT Department. These days, the government has been scrutinizing suspicious transactions even more.